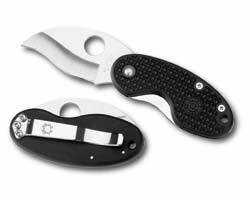 The cricket is a very small and interesting knife from Spyderco. It's smaller than most pocket folders and certainly stranger. starting with the basics the Cricket is a linerlock liner made out of the backside scale of the handle this kind of lock makes the cricket not only small in length but very thin too. The blade made of VG10 steel is shaped ending in a point allows precision cutting jobs so it is a very nice knife for hobbysts (and hobbits too!) . The pocket clip carries the cricket tip-down in your pocket and since it is quite small you can use it as a pocket clip too. The best thing about the cricket is probably the discrete look it has, it doesn't look as a weapon to people's eyes so you won't get in trouble with authorities or scared looks if you carry it around in your pocket or as a money clip. Certainly a very nice and curious knife that deserves a serious look among EDC options. The cricket costs $50 and you can check several options here. More information in Spyderco's website. The Rescom is a Rescue-style knife from Boker USA and while it is intended as a rescue knife, it is also very usable as a cutting tool in general, specially for rope. There are two cutting surfaces in the Rescom, a serrated edge and a cutting hook with micro dentations. The edges are designed to cut seatbelts, rope and clothes in rescue situations. Our tests showed that both the hook and the serrated edge are great for general rope cutting performing very clean cuts, the hook is good to untangle cord, open boxes, cut knots and other tasks. Weighting just 2 and half onzes with a blade of 1 7/8" and overall length 4 1/2" the rescom is very pocketable and goes completely unnoticed. It can even be used as a money clip that will be ready to do the job in case of emergencies. The blade is AUS-8 steel. The scale is textured G10 on one side and bare metal in the other side (where the pocket clip is). The grip is very good, non slippery and for the size of the knife more than confortable to hold the big curved place for your index finger makes the knife safe to use even if you have to use force. The pocket clip is very strong so it might be difficult to clip but once clipped the knife won't get lost. As a rescue tool it is only missing some tip to break glass windows in case of need, as a cutting tool for rope and others it is certainly great. 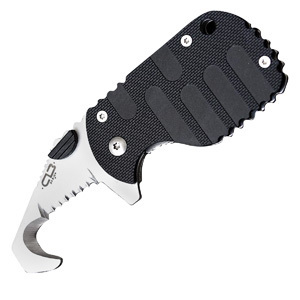 After the tests I liked to have it around to open boxes and cut cord, the non-knife looking is also very safe for urban carry and events where a folding knife would not be welcomed. You can get it from $25 to $40 (varies) from different sites, check froogle's links. For more information you can visit Boker Website and search for "Rescom", product code is BO587. 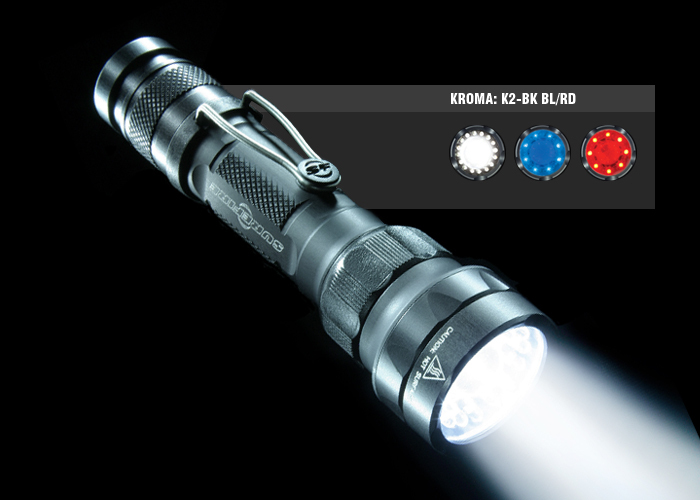 The Kroma is the first surefire model to offer multiple led colors in the same flashlight (the A2 aviator combined leds with an incadescent lamp). The Kroma has a principal 3w luxeon white led and surrounding that led it has sixteen 5mm leds, 8 of them blue and 8 of them red. The flashlight is powered by 2 C123 lithium cells. Low red, High red, Low blue, High Blue, Low white, High White, Low red + High white, High red + High White, Low Blue + High White, High Blue + High White. Combining blue or red with the white central led produces white hotspot with a blue or red corona. We are not sure about a scenario where this could be useful. At maximum level with the high white on the Kroma runs for 1.5 hours while on the red or blue low level it can run for about 80 hours. The red leds are good to preserve night vision, white on low is good for map reading since red marks in a map won't be visible using a red led, blue is good for blood tracing and other specific tasks,blue generates a lot of contrasts so it's nice to search for fallen items to the floor, blue is generally not very good for the eyes so in my personal taste a green/red combo would have been a lot better than red/blue because green is very helpful to attract attention due to its high visibility. The maximum white level is about 50 lumen not as bright as many other 3watt flashlights in the market and certainly not enough for tactical purposes. The Kroma features a TIR lens as in the E1L to tighten the focus of the central led, at close range this means the beam will be square and not a circle. The TIR system makes the led able to throw the beam at further objects but it sacrifices sidespill. This is not a big problem since for close tasks or ambien illumination you can fall back on the 5mm LEDs. As usual in Surefires the construction in HA-III aluminium is excellent, the lens and body will resist hits and impacts without breaking, o-rings make the light waterproof. The Kroma is certainly a very cool light but it has some drawbacks, it is expensive and for most users you will not need all the modes and you may not need one set of leds at all. The total brightness is subpar for a modern flashlight so I would say that it is good as long as you have a practical use for many of the modes it has. The Kroma retails for $300 you can read more in Surefire's website. You can order it form OpticsHQ.